Thirty-one years ago, on October 16th 1984, Forest Service wildlife biologist (and future longtime SNVB member and contributor) Keith Aubry was checking pitfall traps in a stand of old-growth Douglas-fir and western redcedar southeast of Packwood, Washington when he made an exciting discovery: a Larch Mountain salamander (Plethodon larselli), distinctly north of its known range. I recently contacted Dr. Aubry about his discovery while looking back on just how much the known range of this species has changed in the last 30 or so years in advance of a day trip I intended to make out to P. larselli country…..to be continued in next Murreletter. 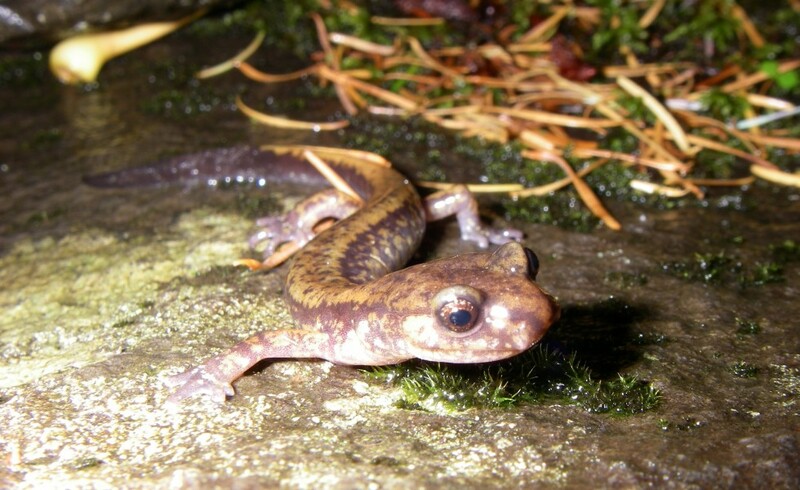 The above Larch Mountain salamander was observed and photographed in the Wind River watershed during a mushroom hunt (specific location withheld, though on this day I found more P. larselli than chanterelles) on October 16th, 2015.